Vice Adm. John Alexander succeeded Vice Adm. Nora Tyson as commander of the San Diego based Third Fleet Friday. 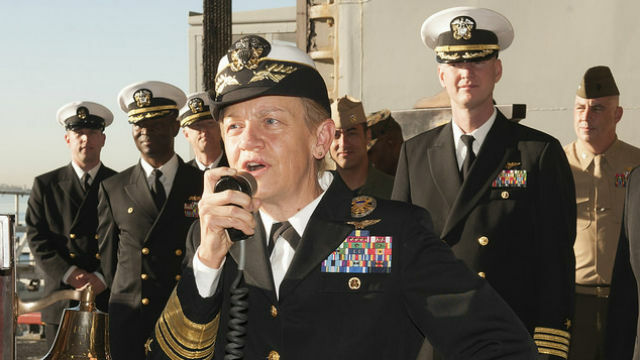 Tyson, who became the first woman to command an operational numbered fleet when she took the position two years ago, is retiring after 38 years of service. Seven years ago, she became the first female commander of a carrier strike group. Under her leadership, the Third Fleet embarked on a new strategy in which it kept operational control of some deployed ships no matter where they ventured. The Third Fleet traditionally commands vessels east of the international date line, and the Seventh Fleet commands those to the west. In the experiment, Tyson’s staff maintained control of deployed vessels even when they ventured into the western Pacific Ocean, providing more command flexibility, Navy officials said. Alexander was director of maritime operations at U.S. Fleet Forces Command over the past year. He previously led the Seventh Fleet battle force in Japan and was commanding officer of the aircraft carrier USS Abraham Lincoln, among numerous assignments. The command change ceremony took place aboard the aircraft carrier USS Theodore Roosevelt, pierside at Naval Air Station North Island.